What you are seeing is my use of Code2Code plugin to generate a base of generators for class templates. You do not have to know that much template engine stuff as it auto generates most o fit right from the java class file you create. 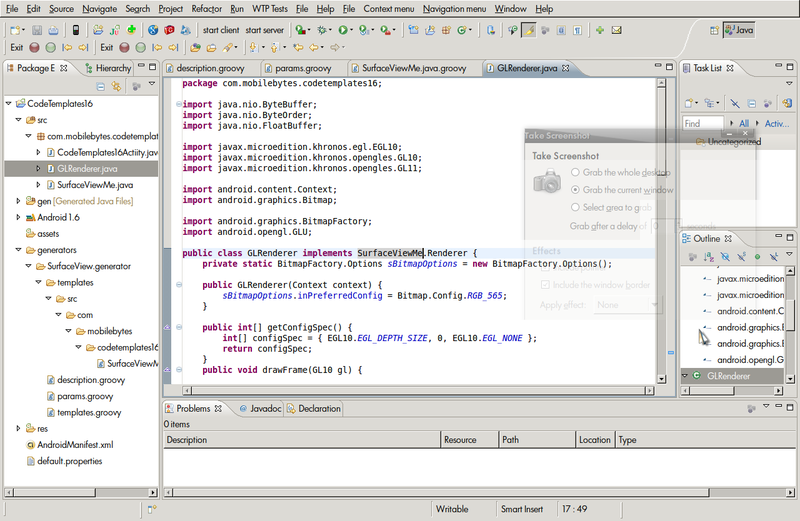 Than to enable copy the generators you need ot project root and change one line of configuration and you all set to go. This time we will have something different. As you know invites to Google Wave canot be sold on places like eBay because its not my copyrights. However, I would like to find some resources in the form of Android Development contracts etc that allows me to compete my first Apress published book. The first 12 that provide some qualified ‘network connection’ towards that set of goals get the Google wave invites. Android-GWT-WebView Book still in process, at this point trying to get the right resources in place. Yes, Apress seems to want the book published. Below, I show how it looks in the emulator but if you load the apk file in a G1 device you will see the same display but with a live color video as background and as foreground it rotated one way and mirrored. It seems there may be some confusion or at least this aspect is not highlighted, ie the difference bewteenSrufaceView and GLSurfaceView. Right now before Android 2.0 GLSurfaceView does not entirely play nice with SurfaceFinger. Let me explain. On G1’s yo can only have one GLSurfaceView. Yes, there are some high end devices coming that can have multiple GLSurfaceViews. Holed on , there is more. GLSurfaceView is not hardware accelerated whereas SurfaceView iis in fact hardware accelerated. Because of the way GLSurfaceView(pre-Anroid 2.0) takes over the framebuffer/SurfaceFinger you will not be able to get and act on user input in a reliable fashion. 2D rendering si suspeneded while control of the SurfaceFinger framebuiffer is held by GLsurfaceView, ie onSrufaceChanged etc. While, yes using SurfaceVie w instead would produce an extra copy, on the G1 that is handled by a hardware 2d blitter and on other Andorid devices by a GPU. Thus, why would you use GLsurfaceView? It has to do with the infrastructure changes that you will see in Android 2.0 and with Android GPU accelerated devices. In other words high end 3d games etc. OpenGL is covered, sprite animation, etc.. If you take a look at Droiddoes.com one item stands out. It states Android 2.0 and is rumoured to be out by end of October. That would seem ot indicate an eclair code drop before October 31st! First, let us correct my error, JBQ explain yesterday that tag Android 1.6r2 is not an OS or SDK release tag. Thus, right now we have a few weeks until the eclair code drops. Will be interesting what shows up in the Camera API.